Many of you probably read The Wonder Years and automatically thought of a young Kevin Arnold chasing around the dreamy girl Winnie Cooper, but it is also the name of a pop/punk band from Philadelphia. 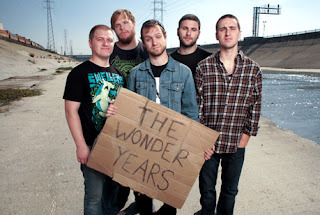 The Wonder Years formed in 2005 and would released their first album in 2007 called Get Stoked On It!. The album would help them develop a fan base. From then on they played shows and continued to release EP's. Not long after their 2010 release The Upsides, they would sign to Hopeless Records. The guys have found themselves getting to tour with New Found Glory, Streetlight Manifesto, Set Your Goals, and Four Year Strong. Not bad gigs if you ask me. Currently, they are working on new material to debut their first release on Hopeless sometime in 2011. The Wonder Years help us relive the popularity of pop/punk from the late 90's to early 2000's, while adding their own fresh ideas to their music. It's fun, energetic, and sing-a-long worthy. Also, some of the songs titles are hilarious: "New Years with Carl Weathers," "It's Never Sunny in South Philadelphia," and "Everything I Own Fits in This Backpack" just to name a few. Watch the official video for "Melrose Diner" below. Fresh?